I can’t pass up pan dulce (Mexican sweet rolls), and I’m always looking for new places to buy them. Each panaderia (bakery) adds its own touch so that while the breads may seem similar, they are also different. Therefore, when I heard that a market in Desert Hot Springs sold pan dulce, I stopped by. The name, Carniceria Rancho Grande, indicates a meat market (carne means meat), but inside I found a well-stocked Mexican grocery, hot food outlet, tortilleria and bakery. My mouth watered as I browsed the tempting dishes prepared for take-out, including carnitas, carne asada, costillas (ribs) in green or red chile chile sauces, bistek (steak) con papas (potatoes), rice, beans and much more. Sadly, I had to pass these up, because they wouldn’t have survived the long drive home. But I did pick up tortillas so freshly made they were still steaming hot, a bag of chips--the real kind, made by frying cut-up tortillas--and some of the best dried California chiles that I have come across, slightly spicy and more flavorful than usual. Perhaps they were grown in the area because they were packed in bulk. And, of course, there was pan dulce, stacked according to type in a large display case in the center of the store. I chose fat, yellow, cake-like buns studded with raisins, fluffy conchas, a fancy cuerno (horn) and shapes that I had not seen before. A list posted by the display specified the ingredients in each. Not all were available that day, which was disappointing--I would have liked the chocolate bread that was listed--but also fortunate. My stuffed freezer couldn’t have held any more than the sackful that I bought. Mexican sweet rolls (pan dulce) are three for $1.19 (larger and stuffed varieties are more) at Carniceria Rancho Grande Supermarket, 13313 Palm Drive, Desert Hot Springs, CA. 92241. Tel: (760) 251-7096 . Good recipes turn up in the oddest places, like a thrift shop in Desert Hot Springs. I was poking through the dishes when I ran into Rosa, who was discussing something in Spanish with her daughter. What I wanted wasn’t a plate or a cup, but a restaurant close by where I could get genuine Mexican food. Rosa knew of just one such place, her home. On that day she was planning to make lentil soup, carne asada and salsa, with fresh tortillas on the side. 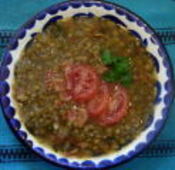 I couldn’t linger, but I did get Rosa’s recipe for sopa de lentejas, a Mexican style lentil soup with tomatoes, cilantro and a touch of heat from jalapeno chile. Rosa adds crumbled bacon at the end, just a little, but it makes a big difference. “You got to let it simmer so everything can come together,” she said. And it does. The bacon gently infuses the soup with its flavor. Rosa’s soup makes a wonderful dinner, along with a green salad, hot corn tortillas and fresh limeade—at least that’s the way I serve it. It’s a far better addition to my table than one more thrift shop plate. Sort the lentils and wash them thoroughly. Heat the oil in a 3-quart saucepan. Add the onion, garlic and chile slices and cook until the onion is tender, about 7 minutes. Add the tomatoes and cilantro and cook 3 minutes, mashing the tomatoes into the mixture as they soften. Add the lentils, water and salt. Bring to a boil, reduce heat, and simmer, loosely covered, 30 minutes. Add the bacon and simmer gently 10 minutes longer to blend the flavors. Taste and add more salt if needed..
Makes 4 main dish servings or 8 servings as a first course. The best things in life can indeed be free, or at least cost no more than a drive to the Coachella Valley. I’m talking about the water in Desert Hot Springs, the cleanest, clearest, finest water that I have ever tasted. And it’s free. Just turn on a tap and enjoy. The water starts as snow on top of Mount San Gorgonio. As it melts, it slowly trickles through rocks, boulders, gravel and sand until it emerges as a limpid, delightful beverage. I encountered it at Miracle Springs Resort & Spa, a laid-back place where I spent a few days. 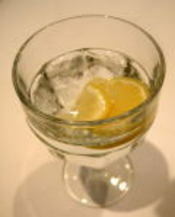 At dinner, I drank goblet after goblet of this enchanting water, dressed up with ice and lemon slices. I didn’t want wine. This was better. My advice is take along empty bottles, jugs, buckets, tanks—the bigger the better—so that you can bring home enough water to enjoy for a few days, even serve at a dinner party. It is definitely worth the trip. Miracle Springs Resort & Spa, 10625 Palm Drive, Desert Hot Springs, CA 92240. Tel: (760) 329-6000 or (800) 808-7727. Adelaida Cellars Roussanne Grenache Blanc 2005. The bad news is, this Central Coast white Rhone blend is sold out. However, the 2006 is due to be released in time for spring and summer dining. The 2005 is 57 % Grenache Blanc and 43% Roussanne, grown in calcareous soil that is ideal for Rhone wines. Crisp and fruity, with nice acid, it is a delightful food wine and so well balanced that the high alcohol content—14.9 %.—isn’t apparent. The winery retail price is $27. 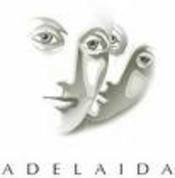 For further information, go to http://www.adelaida.com. “We serve breakfast, lunch and Mexican food,” announces Los Robles Café in Paso Robles, as if Mexican food were a thing apart from ordinary meals. That is not the case, though. Breakfast at Los Robles is likely to be chilaquiles, huevos rancheros, huevos a la mexicana, machaca or other typically Mexican fare. And lunch could be chile verde, camarones al mojo de ajo, fajitas, chiles rellenos, a torta (sandwich) or a burrito. This modest, pleasant restaurant re-opened Thanksgiving Day, 2007, after two years of remodeling. That was a long time to be denied such good food as my hearty plate of chilaquiles, pinto beans and home fries. Yes, home fries and ketchup—Mexican-American style fusion. The freshly made chilaquiles (tortilla hash) were delicious, with good tortilla texture, meaning not soggy, and a sauce made from grilled tomatoes, tomatillos and jalapenos. Ignacio and Maria Torres are the owners, and Ignacio is the chef. 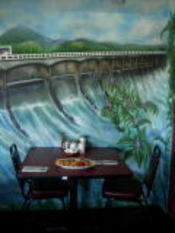 They’re from San Jose Piedras Blancas in the state of Michoacan, and a large, colorful mural of the Piedras Blancas bridge dominates the restaurant. Los Robles Café serves breakfast, lunch--and Mexican food--Monday through Wednesday, but stays open for dinner Thursday through Sunday. Los Robles Café, 1420 Spring Street, Paso Robles, CA 93446. Tel: (805) 239-8526. Argentina is proud of its empanadas, and I’ve eaten many of them in Buenos Aires and elsewhere, most of them quite good. 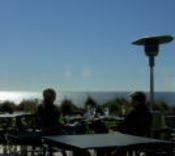 Then, one Sunday, I had really sensational empanadas, not in Argentina but on the coast of California at Pismo Beach. They were pulled pork empanadas filled with the most succulent, flavorful m eat you could hope to eat. The pork had been cured overnight with a dry rub of paprika, cayenne, garlic and onion, then braised slowly and, finally, combined with specially made barbecue sauce and wrapped in flaky pastry. It takes a serious chef like Evan Treadwell to elevate turnovers to this level. Mendocino-born Treadwell is executive chef of the Dolphin Bay Hotel’s Lido Restaurant. And he’s intent on making the Central Coast known for serious cuisine. Lido’s Sunday brunch should go a long way toward making this happen. The food is spectacular. And so is the view from the restaurant, a broad curve of shore and sparkling ocean. When the weather is nice, you can sit outside. The three-course brunch allows plenty of time to appreciate the view. The menu, which changes seasonally, offers many choices, and not just omelets and quiches. The empanadas, paired with a lively carrot, jicama and apple slaw, are among the starters. That alone was enough for brunch, but I am no one to resist a beautifully cooked prime flat iron steak crowned with a pillar of buttermilk fried onion rings. There were a lot of flavors on that plate, including caramelized onions, garlicky green beans and a salsa verde for the steak. I expected a Mexican chile salsa, but Treadwell had something else in mind, an Italian style sauce that blended parsley, tarragon and thyme with capers, onion, garlic and olive oil . A rich dessert was overkill after this. Nevertheless, I consumed far too much of a chocolate hazelnut torte, an unctuous thing of creamy, rich chocolate, chopped nuts, whipped cream and a swirl of crème anglaise. Brunch starts with a mimosa or champagne (I had a sparkler from Laetitia in the Arroyo Grande Valley) and includes coffee. The price, $29, is as extraordinary as the food. Sunday brunch takes place from 7:30 a.m. to 2 p.m. at Lido Restaurant at Dolphin Bay Hotel and Residence, 2727 Shell Beach Road, Pismo Beach, CA 93449. Tel: (805) 773-8900. I have so many friends who don't eat red meat that it seems all I ever cook is chicken. But here I am, in a very good restaurant, free to order anything I like. And what do I ask for? Chicken. 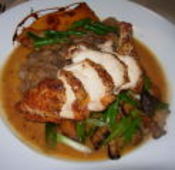 Well, there's a good reason--the stunning chicken saute sec at Matthew's in downtown Paso Robles. Chef/owner Matthew Riley knows how to cook chicken so that the skin is crackly crisp and dry, so savory and irresistible that I would order this dish for the skin alone. But the chicken is fine too. It's a free-range breast cooked with mushrooms and green onions in a white wine reduction. A great supporter of area wines, Riley made the wine reduction for my order with Palette de Blanc from Pretty-Smith Vineyards & Winery, which is located at San Miguel, north of Paso Robles. That wine is a blend of Sauvignon Blanc, Chardonnay and Muscat Canelli. 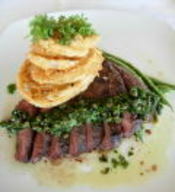 The accompaniments were Lyonnaise potatoes, grilled pumpkin brushed with olive oil and crisp green beans. The vegetables change with the season. Breast of chicken saute sec is also on the menu at Matthew's at the Airport in the terminal of the Paso Robles Municipal Airport. Overlooking the runway, this restaurant attracts fly-in diners (Riley lets you know that Angelina Jolie is one of them) as well as Paso residents and visitors. The downtown restaurant, a cozy place with big booths and a bartender known for martinis, opened in 2007. 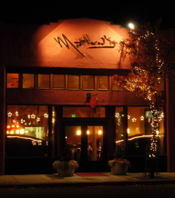 Matthew's, 1215 Spring Street, Paso Robles, CA 93446. Tel: (805) 237-7333. Matthew's at the Airport, 4900 Wing Way, Paso Robles, CA 93446. Tel: (805) 237-2007. I think of all-you-can-eat restaurants as places where the food is mediocre enough not to cost very much. This is certainly not the case with Choi Family Restaurant in Koreatown, where you can barbecue unlimited amounts of meat for just $14.99 a person. The quality of the meat is good, better than at some pricier Korean barbecue restaurants in Los Angeles. The downside is, you may have to wait a long time for a table at peak hours. Those already seated ignore the impatient queue as they leisurely demolish platter after platter of rosy, appetizing meats. The choices are brisket, pork belly, beef ribs, tripe and beef tongue. The meats are not marinated. If you think the natural flavor needs embellishing, you can dip them after grilling in a mixture of sesame oil, salt and pepper or a tangy combination of soy sauce, vinegar and a jalapeno slice. Another option is to wrap the cooked meats in soft squares of rice paper along with lettuce and such condiments as red pepper paste, seasoned bean paste, sliced garlic and jalapenos. The six of us who gathered there one Sunday finished off four and a half platters piled high with meat. We grilled thin slices of beef tongue, pork slices as thin as bacon but not cured, beef rib meat, and a cut that was new to me, chadol bagi. Chadol means quartz, a Korean friend explained, and bagi means inserted, a picturesque way of describing beef with white fat, cut from the middle of a beef brisket. Sliced very thin along with the fat, chado l bagi cooks up crisp like bacon and is just as addictive. We set our cooked meats on a bowl of salad greens--the restaurant didn’t provide rice--and snacked on side dishes such as marinated broccoli with hot dog slices (better than it sounds), kimchi with oysters, glossy seaweed and a soft egg custard served in a stone bowl. Korean sweet potato sticks, crisp like apple, were delicious to eat raw, even better grilled. Bubbling away on top of the grill was a pot of doenjang jjigae, a fermented bean paste stew that included crab, mussels, clams, squid, zucchini and tofu along with onion and garlic. Rich and filling, the stew was replenished as needed. The last course, included in the price of the dinner, was the cold noodle soup naengmyeon. Strips of cucumber and daikon floated in the broth, along with chewy fine potato starch noodles. We perked up the flavor by stirring in mustard and vinegar. The only dessert was chewing gum. But after so much food, even that was more than I could handle. 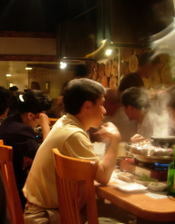 Choi Family Restaurant, Korean B.B.Q., 3916 Wilshire Blvd., Los Angeles, CA 90010. Tel: (213) 382-8988. 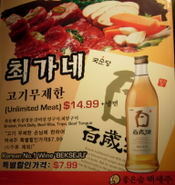 (Except for “Korean B.B.Q.,” the name is only in Korean.) The $14.99 barbecue price requires two or more orders.